When you register you HAVE the option to add the Business Coaching Den to your program. You get a total estimated value of over $4000 for only $950! Success for Women in Agri-Food is a unique program available to women ag-entrepreneurs across the agri-food value chain. We invite you to participate regardless of the stage you are in - dreaming, developing business, growth or scale-up. 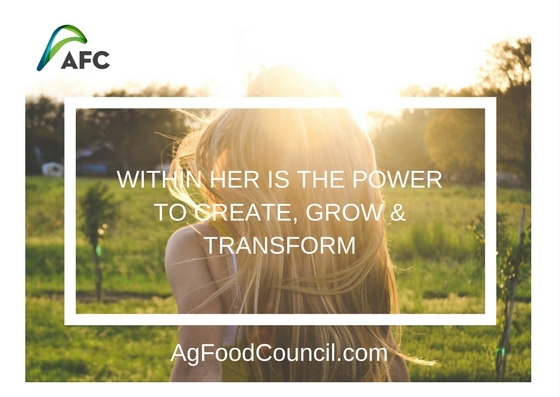 From primary to production, to value-added, or those in food processing and sales in retail markets; all women in business in agriculture and agri-food are welcome. 1. GoForth 100 Essential Small Business Skills Learning Series – This exceptional program provides you with a foundation on all facets needed to run a successful business. The series includes a host of resources for long term use. 2. In Person Workshops – There will be four workshops throughout the program, facilitated by experts in their field and aim to showcase woman ag-entrepreneurs. Held in both locations, the workshops will build on the concepts learned, as well as promote networking among participants. Topics will be business and/or policy related and will provide an opportunity to engage in discussion and will include an oportunity to pitch your business and have it critiqued. The fourth workshop topic will be decided by the groups. 3. Networking opportunities – Together, the workshops and virtual forums for discussion, will offer participants the opportunity to network with each other - to learn, share and grow their networks; which is necessary in growing business. 4. Mentorship Program – Mentors represent the achievement of success and what people can aspire to, and learn from. To address the desire for mentors by woman ag-entrepreneurs, we have developed a mentorship component in the Success for Women in Agri-Food program, providing the opportunity to learn from role models who overcame similar challenges faced by program participants; including how they captured opportunities in a sometimes male dominated industry. PLUS! Add this optional one-on-one Business Coaching Den! Imagine having access to coaching from several industry experts – all at the same time! Imagine having customized coaching to help focus on the key success factors for your business! If you are starting a business, or if you want to enhance your existing business, the Business Coaching Den is a powerful program for you to use. You will have an opportunity to talk with a panel of business experts about specific challenges you are facing. The experts will provide you with their comments and suggestions about ways to address your challenges and enhance your business. Prior to meeting with the experts, you will receive one-on-one coaching from Corey Keith of Keith and Associates to prepare you and to ensure you get maximum value from your time with the experts. After the meeting, you will receive an overview of the experts' suggestions, as well as additional one-on-one coaching with Corey that will include developing strategies and an Action Plan for implementation. “The Business Den was a great experience that provided us with incredibly valuable advice and focus. It really helped us enhance our business and move forward with confidence. Corey walked us through the entire process with excellent encouragement and advice. I highly recommend that anyone with access to this program take advantage of the opportunity! “Participation in the Business Den was a great opportunity! We have gained so much to help us plan our next steps in becoming a successful Agri-Food Processor! Thanks again to all involved!